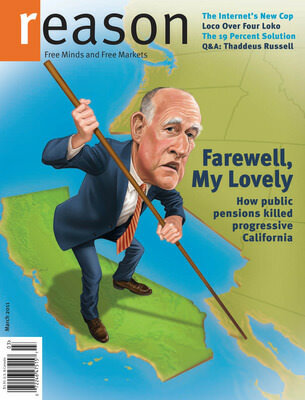 Libertarian editor of Reason magazine Matt Welch sprays bracing ice water on the recent optimistic articles on California’s fiscal mess. The city of San Bernardino won an important victory in its request for bankruptcy protection Friday, Dec. 21, when a judge denied CalPERS’ attempt to force payment of unpaid pension obligations through state court. CalPERS, the state retirement system, is the city’s largest creditor. CalPERS had filed a motion for relief from the automatic protection from creditors under bankruptcy law that came with San Bernardino’s Aug. 1 Chapter 9 petition. “Without that, the system falters, and it will ultimately fail if enough employers don’t participate,” Gearin said. I’ll be happier than Huell Howser tripping on acid when the Golden State makes its long-delayed comeback, but the structural problems of converting tax dollars into a guaranteed pension machine are vast and ongoing, and it’s going to take more than one month of sub-10% unemployment since January 2009 to get me busting out the Phantom Planet catalogue. Unemployment is high; infrastructure is neglected; the pride of California, its UC Colleges, must raise tuition beyond the reach of the very people it was supposed to lift into higher education; California’s State Parks, another treasure, are neglected and being closed. Fortunately, there’s a solution — and it’s right in our neighborhood. We’ve seen the wealth created by a flurry of recent Valley IPOs, and we’ve watched the rise in share price of more established companies. From Apple to Zynga, Facebook, and LinkedIn, we have a fresh crop of McBillionaires ready to help. So, here’s what we’re going to do. First, let’s all agree: $100K in monthly compensation is plenty. Beyond that, a 75% tax rate will help replenish the Golden State’s coffers. Second, millionaires and billionaires won’t suffer much from a small yearly tax on their assets: 0.25% from $1.5M to $5M, half a penny on every asset dollar from $5M and up. Simplifying a bit, if you have $10M in assets you’ll pay about $50K in asset taxes every year, $100M yields $500K, $1B (think Facebook IPO) brings in $5M, and so on. A pittance for the great feeling of helping one’s fellow Californians. Read the whole thing » What do you think? Searching for facts on California’s actual coal-fired electricity consumption, I found the Milford et al report “Clearing California’s Coal Shadow from the American West” [PDF]. The latest data therein is 2004, when California’s coal-fired electricity consumption was about 20%. California politicians prefer to quote the “inside California borders” coal burning stats, which according to EIA data was around 1.2% in 2010. The strategy of the politicians has been to drive energy-intensive businesses out of the state, and to outsource the pollution associated with power generation so that other Western states can “enjoy” the coal mining and burning. Far from the southern California beaches, the movie studios of Hollywood, and the Golden Gate Bridge, a fleet of coal plants in distant western states churns out power for the California market. These coal plants discharge vast quantities of air pollution, consume huge amounts of water and emit destructive global warm- ing gases. Some of the largest mining operations in the United States tear up the land to provide the coal they burn. While the power from these coal plants is transmitted many miles to customers in California, the pollution and environ- mental disturbances stay behind, sending a cascade of human health and environ- mental impacts across the American West and the globe. Although coal-fired electricity production accounts for a smaller share of California’s power mix than it does in other western states, the sheer size of the California market means that the Golden State’s consumption of coal-based power casts a long shadow over the American West. (…) In 2004, coal plants located in the interior West supplied an estimated 20% of all electricity in California, which is twice the share that comes from renewables. Large quantities of air pollution are discharged from these coal plants. (…) Coal-fired power plants owned by California utilities also consume precious water in the Southwest. The Navajo Generating Station and the Four Corners Power Plant each con- sume more than 8 billion gallons of water every year. The environmental footprint of coal-fired power plants further extends to the coal-mining operations that supply them. The Black Mesa-Kayenta mining complex, which supplies the Mohave and Navajo generating stations, is one of the largest strip-mining operations in the United States. I got all worried just reading your synopses. Understood — California has nearly run out of rope. However, as I understand the situation, the train wreck happens first at the local level, like Vallejo, San Jose. I wonder how Los Altos, Palo Alto are doing? If your local community budget is in balance (to keep fire, police, libraries, schools going) how much are you personally impacted when California defaults? I really don’t know. The default of San Jose might turn out to have more local impact. Try to educate all the people in your influence circle. This might not be true in your neighborhood, but it is obvious that the majority of California voters prefer ‘magical thinking’ to critical thinking. Personally I do not believe any of the US state/local governments can be gracefully reformed. Especially California because the voters have supported a political redesign that is seriously dysfunctional. E.g., voting for an initiative with big costs BUT for which there is no attached funding legislation. If I’m correct then serious reform is only likely to grow out of the ashes. When TV coverage every night is focused upon where all the money went (into union pockets) people will eventually figure out a better way forward. Should we cash in and simply run away to sea? Very interesting question! I wonder – would Warren Buffett say “get liquid because there are going to be best-of-lifetime deals to buy”? Fortunes were made by investing on the backside of a crash. If you’ve not yet seen Bill Gates TED Talk on the state budget crisis, it is a terrific talk, highly recommended. For more analysis on California, this book has been recommended (we haven’t read it yet): California Crackup: How Reform Broke the Golden State and How We Can Fix It. Whatever happens, I’ll speculate that California taxes will have to go up, maybe via a EU-size 20% VAT (less dead weight than higher income taxes)?